Iraq Kurdistan's President Masoud Barzani said that the the Iraqi Kurds try to hold referendum on the region's independence this year before October. MOSCOW (Sputnik) — Iraqi Kurdistan intends to hold the referendum on the region's independence by October, the autonomous region's President Masoud Barzani said. "I can say with utter conviction that, barring circumstances beyond our control, that yes, we are trying to do it this year…. 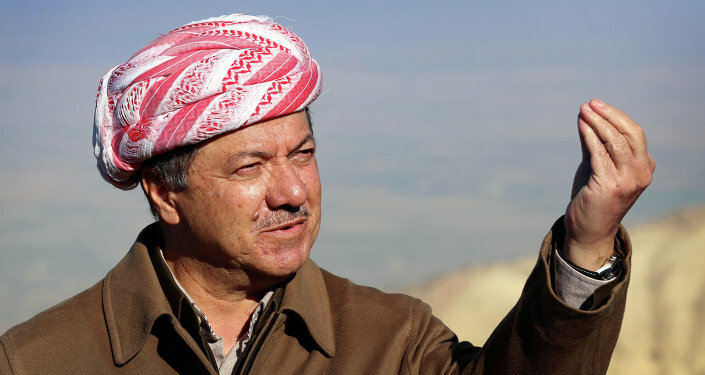 I think it will be before October," Barzani said in an interview with the Al-Monitor online newspaper on Tuesday. Barzani criticized Baghdad for freezing the Kurdish region's share of the federal budget, which the Iraqi parliament set at 17 percent in December. The move has restricted the region's options to either reintegrating with Iraq as a province or declaring independence, he added. The referendum should not strain relations with Turkey, as it would not impact Turkish Kurds, the president said, adding that the region will seek dialogue with both Iran and Iraq, conducting the separation peacefully. In early February, Barzani stated that the time was right for the region to hold a statehood referendum. On March 10, a member of Iraq's Kurdistan Democratic Party told Sputnik Turkey that the region would hold an independence referendum in 2016. Iraqi Kurdistan is an autonomous region in northern Iraq, which became autonomous in 2005, following the US invasion of Iraq and the adoption of a new constitution. Kurds are a Middle Eastern ethnic group with the population of some 30-35 million living mainly in Turkey, Iran, Iraq and Syria.